August 14th, 2014 | Moving Tips, Organizing and Decorating. Both the basement and the attic share a central purpose of providing long- and short-term storage for other areas of the house. Keeping these rooms organized will save time packing before relocating. The first step when organizing these two rooms is removing everything and cleaning thoroughly. Cleaning is necessary as both rooms are prone to insect and rodent infestation. Donate or discard the items that you no longer want. 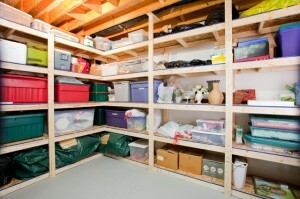 Work on one zone at a time and take as much time is needed to ensure the best organization for each room. Homeowners need to be prepared for natural and manmade disasters. The first step is to create a home emergency kit and store it in the basement where you and your family would gather in the event of an emergency. Recommended items to keep near this area include three gallons of water, a three-day supply of food, change of clothes, flashlight, battery powered radio, extra batteries, first-aid kit, toiletry articles, backup medications, a can opener, duct tape and garbage bags. Also, include a list of emergency contacts in the kit. The key to getting the most out of your home workshop are a physical setup that lets you work smoothly without creating clutter and safety elements that ensure your projects present no danger to you or your family. A good work table has adequate space and is sturdy. Adding shelves or cabinets to the work area will help with organization. To store tools, use a toolbox, magnetic tool holders or bench top organizers. Be sure that the basement work area has proper ventilation, fire safety and waste disposal for hobbies that may require these features. Hazardous materials, such as cleaning supplies and flammable materials, could be dangerous to children and pets. These items should be locked in a cabinet and should be positioned out of the general flow of the basement traffic. Metal cabinets are best used to contain these items. Position this far from the hazardous material area. The food zones in the basement are a backup for your pantry. It is an area to put non-perishable foods that are bought in bulk. Make sure stored food and beverage are kept up off of the floor, position foods by type, put new purchases in the back and make sure dry-goods are non-absorbent. The basement is also the perfect place to store wine, which is best kept in darkness with a lower temperature. The basement is a great place to put overflow from the household, garage or outdoors. Shelves are a great way for storing season items. 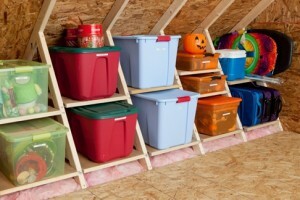 Due to the basement being damp and susceptible to mold and mildew, it is best to keep excess clothing in the attic. Before storing clothing, make sure it is completely clean as a little dirt can create bad odor and stains that attracts insects over time. 1. Remove Accessories – Remove the jewelry and decorative ornamentation on clothing as it can tear other garments. 2. Empty Pockets – Items left in pockets can leave permanent distortion. 3. Button Up – Close all fasteners on clothing to maintain its proper shape. 4. Clean First – Dry clean or wash clothes one last time. The smallest amount of dirt can damage and cause odors on the clothing. Never starch the clothes because it can cause yellowing and attract insects. 5. Bag Free – Do not store clothing on plastic bags, including the plastic that your dry cleaner uses to protect your garment. Plastic traps moisture and can cause mold and mildew. For clothes that can be folded, use waterproof, vented boxes for storing other than wool items. Store wool pieces in a cedar chest. Make sure the boxes are sealed well to prevent insects from entering. Group the clothing in the boxes by type and label, so it is easy to find when needed. If you move, these will already be pack and ready for the trip. Some clothes, such as dresses and coats, should be hung to maintain their shape. Vented fabric garment bags with zippers and opaque, insect-resistant linings are ideal for precious clothes that you want to protect as thoroughly as possible. The goal is to protect memorabilia against breakage and deterioration. Lined and padded memory chests are ideal containers for precious objects. If you decide to put items in plastic or cardboard boxes, make sure all breakables are thoroughly protected by padding. Dedicate a corner of the attic for holiday decorations to ensure they stay in good shape. Don’t store decorations loose. For ornaments, you can store them in something such as wood chests, but you can also use cardboard or plastic boxes. A spool for holiday lights is the best way to organize holiday lights or buy a special plastic boxes with slots. Extra room in the attic can serve as long-term storage for papers and legal documents. Use file-holder boxes with built in supports that keep file upright and organized. Label the boxes and stack them, neatly, in the most out of the way corner in the attic. You may want to consider a fireproof or fire-resistant box or a safe for these papers. Because the attic and basement tends to become the dumping ground for household goods that have no where to go, it is essential to check the area every six months or so to make sure the area is still in order. Check the emergency kit supplies every three months to confirm that batteries are still good, equipment is functioning and food and water supplies are not leaking or damaged. With the change of the seasons, check on clothing and long-term storage to ensure that it is neatly organized and no insects have gotten to them. On Tuesday, August 19 we will continue with Garage and Shed organization.